What is unique about the Psalms? Watch as W. Robert Godfrey explains that they are not only God’s Word to us but also our words to God. I think what we lose as believers if we neglect the Psalms, is a knowledge of the one book in the whole Bible that gives us words to speak to God. The whole Bible including the Psalms are God’s Word to us, but the Psalms uniquely are not only God’s Word to us but also our words to God. So we have a pattern, we have direction, we have a shape of how we should be free to speak to God, and I think when we learn more about how God delights to have us speak to Him our relationship with him really grows and flourishes. 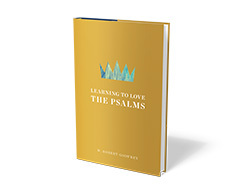 Learning to Love the Psalms by W. Robert Godfrey is available from Reformation Trust Publishing in the Ligonier store.